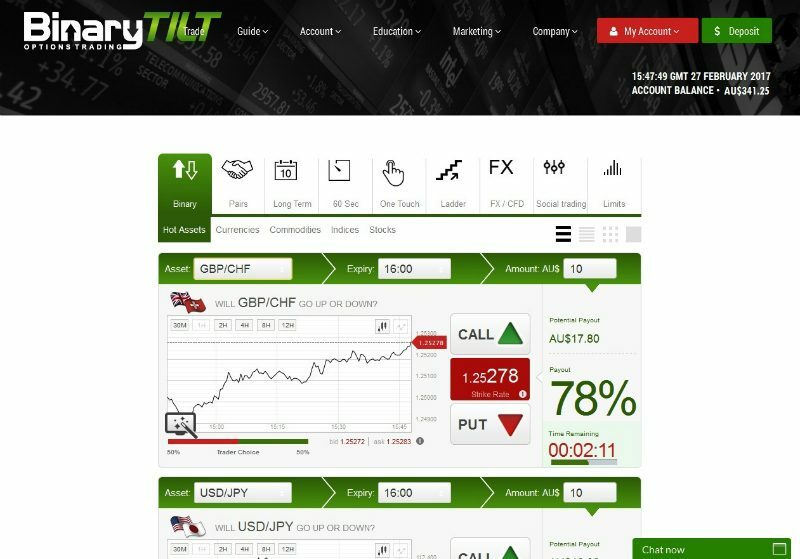 BinaryTilt was launched in 2013 and have since established themselves as one of the trusted and respected binary options brokers. The parent company is Depix Holdings Limited and they are based in New Zealand. You can safely place your money with them as they are fully regulated by New Zealand’s FSP (Financial Services Provider). 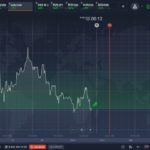 In this review, we look at the chief tools and features offered by this broker so that you can gauge whether they are the right choice for your trading needs. BinaryTilt reviews show this broker uses the MarketsPulse trading platform which is a pioneer in the binary trading industry. This platform provides innovative and attractive features, and is easy to learn and use. The main tabs provide access to sections such as trade options, trading floor, banking, education, account types, and contact information. The platform’s lower part provides a full list of the services and tools available from which you can select suitable ones. Besides English, the trading platform is available in Arabic, Japanese, and Chinese. To open an account, you need to deposit a minimum of $500. You can get unlimited bonus, but check out the fine print for terms and conditions. The maximum payout rate is 100% which is quite high compared to other binary options brokers. Minimum investment amount is $10 and the maximum amount for a single trade is $250. Besides USD, you can open an account in other currencies such as GBP, EUR, CNY, JPY, CAD, AUD, and ZAR. BinaryTilt reviews show that available trade types are: High/Low, One Touch, Ladder Options, Pairs, Long Term, Boundary, and Option Builder. Available expiry times are: 30 and 60 seconds, 2, 15, and 30 minutes, and 1, 24, and 24+ hours. The Candlesticks tool displays an overview of asset price status. Plus, you can try out various strategies like Moving Average, RSI, or Bollinger Bands. You can trade in a range of assets including stocks, indices, currencies, and commodities. 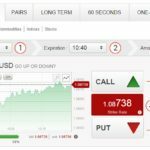 BinaryTilt offers two unique features that make it stand out among binary options brokers: Rollover – You can postpone the expiry time when you are losing and you can do this once per trade. Double Up – You can double the trade if you are winning to earn more money. BinaryTilt offers mobile apps for Apple and Android tablets and smartphones to enable you to trade from anywhere. You can download the apps from the App Store and Google Play. Binary Tilt also provides a demo account with $1000 virtual money that can be utilized for 5 days. You can use the demo account for practice and learn the different elements and tools of the platform before you invest actual money. BinaryTilt offers 6 trading accounts and an Islamic account for Muslim traders. This account adheres to Hibah, No Riba, and Murabahah policies. BinaryTilt offers top notch 24/7 customer support via phone, email, live chat, and web form. You can contact their email agents on support@binarytilt.com. Phone numbers are provided for individual countries such as the UK, South Africa, Cyprus, Canada, UAE, and Australia. BinaryTilt offers an outstanding array of educational tools for both novices as well as experienced traders. These materials cover basic trading, market analysis, ebook, platform overview, trading signals, and successful strategies. In addition, you can benefit from useful articles, glossary, and economic calendar to maximize your chances of winning. You can select from multiple secure methods to deposit and withdraw money. Deposit options include credit and debit cards (Visa, MasterCard, and Maestro), bank wire, and e-wallets (PaySafe Card, GiroPay, Yandex.Money, Neteller, QIWI, UnionPay, CashU, WebMoney, and Skrill Moneybookers). Your money and personal information are safe with this broker as they utilize SSL encryption technology to safeguard all transactions. You can withdraw in multiple currencies and the minimum withdrawal amount is $50. Average time for withdrawal is 3 business days while withdrawals via e-wallets can take up to 10 business days. You are allowed 1 free withdrawal each month. For subsequent withdrawals, there is a $25 fee. Australia-based traders get free withdrawals via wire transfer, while those outside Australia are charged a $20 fee. On the pros side, we count the multiple banking options, top notch customer support via multiple channels, professional trading platform, nice range of currency pairs for trading, and user-friendly website. On the flip side, the only drawback we came across is that the browser can become a bit slow at times. In short, we welcome you to try out BinaryTilt as they are a fully regulated broker that offer an innovative trading platform and tools that you are sure to enjoy.